Image above: The three top managers at ABB Sweden emphasize the importance of cooperation. 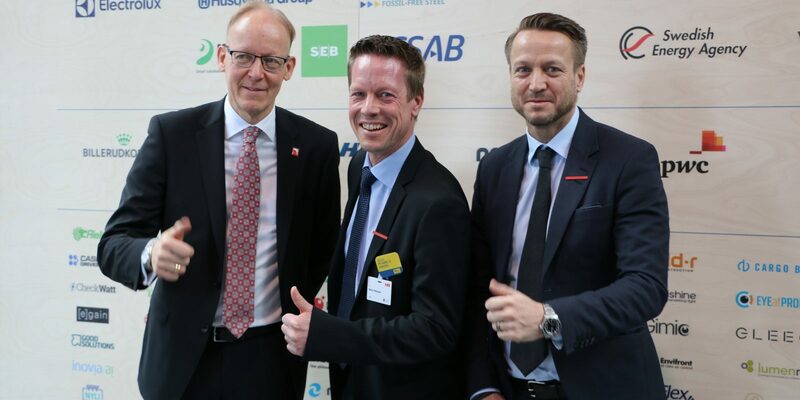 From left Johan Söderström, Country Managing Director for ABB Sweden, together with the Business Managers in Sweden Mats Peterson and Dennis Helfridsson. Photo: Mikael Hansson. Cooperation is a connecting thread through ABB’s presence at this year’s Hannover Messe. 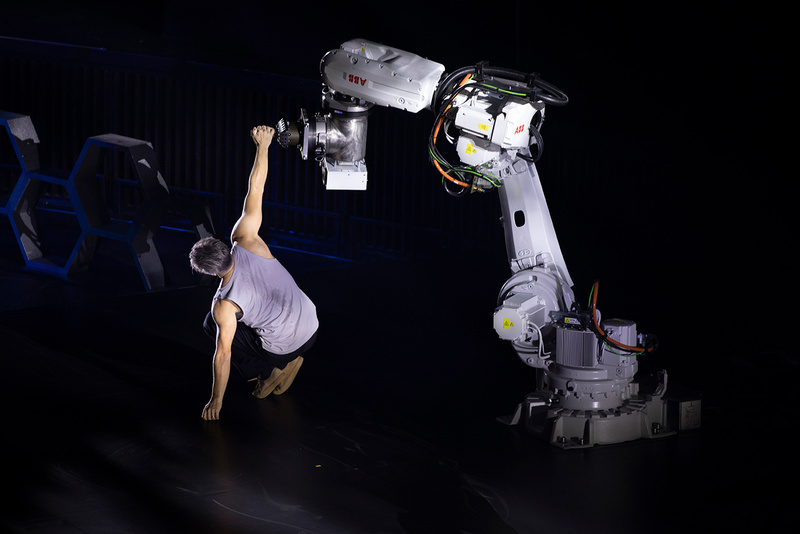 Visible as a collaboration between human and robot in the inauguration’s spectacular dance with one of ABB’s industrial robots. As cooperation with schools with invited students programming smart factories. Or announced as large agreements with other companies like Ericsson, or as a glimpse of cooperation with governments and decision makers when Chancellor Angela Merkel and Prime Minister Stefan Löfven are shown around among ABB’s many booths. The dance at the inauguration of the fair between Fredrik “Benke” Rydman and one of ABB’s industrial robots illustrates cooperation between man and robot. Photo: Stefan Hollertz. Cooperation is a necessity for every industry that want to manage a rapidly digitized technology development. No company can cope with the challenges of the future on its own, emphasizes three of ABB’s top executives, when, in a small secluded room, in the middle of Sweden’s national pavilion at the Hannover Fair, we sit down for a brief interview on ABB’s vision on cooperation and collaboration with other companies as well as the whole society. Around the table is Johan Söderström, Country Managing Director for ABB Sweden, Mats Peterson, Business Manager ABB Electrification in Sweden, and Dennis Helfridsson, Business Manager ABB Robotics & Discrete Automation in Sweden. One example of cooperation can be found in the need for creating fossil-free transports in Sweden, a goal that the government challenges the industry to cover. ABB has signed up for this by 2030, and without collaborating it will not succeed, stresses Mats Peterson. “Cooperation and collaboration are incredibly important to us. For example, we collaborate on smartly connected national services to offer charging infrastructure for electric vehicles with Vattenfall, E.ON and others,” says Mats Peterson. “We work with Epiroc and other companies in the mining industry. If you would build a mine today you would question the idea of taking in a diesel-powered mining truck where there is no ventilation. The electrification of mining trucks will take off quickly in the mining industry,” emphasizes Mats Peterson. Dennis Helfridsson, agrees with the view that collaborations are a cornerstone of today’s industries. “Cooperation is everything for us. Technology development is so fast and we have to work with the best. It is also one of the reasons why we sit down with Ericsson, to get a stable network to be able to connect our factories,” says Dennis Helfridsson and refers to the 5G agreement that ABB and Ericsson signed at the Hannover Messe. Along with the partnerships with Microsoft and IBM on the development of, among other things, robotics and an agreement with French Dassault on software development, it is a visible sign of how companies today must seek collaborations to survive. In the Swedish automation pavilion, ten companies with cutting-edge expertise in automation meets ABB. Photo: Stefan Hollertz. There are also collaborations with smaller companies and startups. At the Hannover Messe, ABB’s growth hub Synerleap is takes part in many seminars. In Synerleap ABB has created a hub with over 20 startup companies that are offered all the ABB resources and connection with ABB’s customers around the world. For large companies like ABB, collaboration with startups has become an important inspiration to new cutting-edge knowledge at a time when digitalization is speeding at a fast pace. 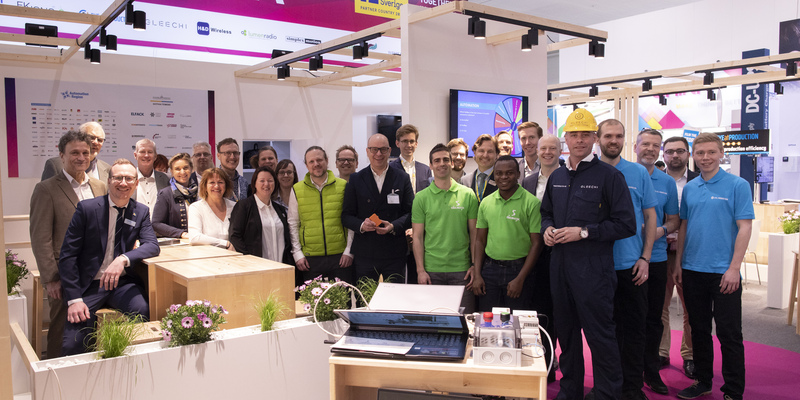 Therefore, it was also natural that Johan Söderström brought ABB to the Swedish automation pavilion at the Hannover Messe, where ten companies with cutting-edge expertise in automation showed their products and services. The pavilion was arranged by the Vinnväxt initiative Automation Region from Västerås and the Swedish Exhibition & Congress Centre from Gothenburg. Johan Söderström emphasizes that he appreciates meeting the companies. 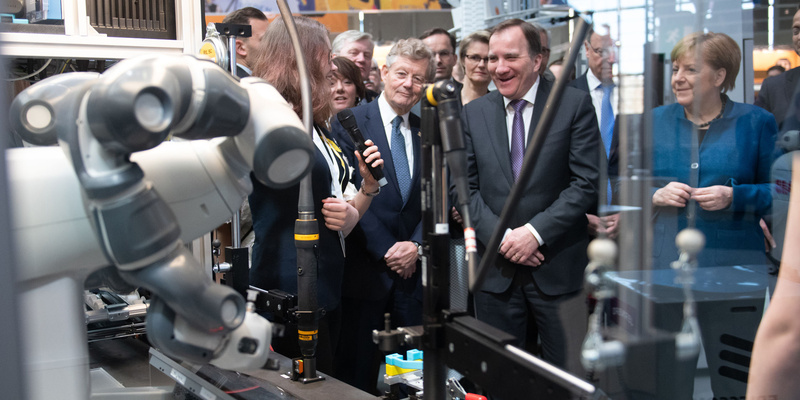 “We thought it was good to have a meeting in the automation pavilion and also that the Swedish Minister for Higher Education and Research, Matilda Ernkrans, came along,” says Johan Söderström. “We really believe in the symbiosis between big companies and small ones. We really want to make things happen, so that it not only becomes seminars,” continues Johan Söderström. Two 17-year-olds show the programming of the ABB robot Yumi in a meeting with Prime Minister Stefan Löfven and Chancellor Angela Merkel. Photo: Deutsche Messe. Johan Söderström also emphasizes the importance of cooperation with schools and young people. He believes that it is extremely important that young people get in close contact with the industry so that they can discover which exciting environment it is to work in. One example is Smart Factories, an initiative where high school students and students get to work directly with the industry. Students at Chalmers have, for example, in collaboration with ABB and ÅF, developed a dynamic 3D model of a factory. At the Hannover Messe, both students from upper secondary school and university participate to show how the smart factories of the future will look. During the opening ceremony, they were also given the opportunity to show this to Prime Minister Stefan Löfven and Chancellor Angela Merkel, as well as a large number of ministers and leaders of authorities. “It is very positive that the young people are here and can show that they can program very difficult moments already in the second class in high school when they are 17,” says Johan Söderström before joining Mats Peterson and Dennis Helfridsson to the next program point.